1. Start by blowing out a large white chicken egg (Get the How-To) and splitting it in half, lengthwise. The egg can be cracked by striking it against a surface or cut with a small pair of scissors. Make sure the inside of the eggshell is clean and dry. 2. With a small paintbrush, apply white glue to the inside and cracked edges of each half of the eggshell and sprinkle with alum powder until completely coated. Set eggshell halves aside to dry overnight. 4. Add 3/4 cup of alum powder to the hot dye bath and stir until completely dissolved. If there are remaining crystals in the bottom of the container, place the solution in the microwave for a few minutes to dissolve them. This will prevent alum from being drawn away from the geode. 5. Once the alum is completely dissolved, let the solution cool slightly (for about 30 minutes) and then submerge one of the dried, alum-coated eggshells in the growing solution, allowing it to rest on the bottom of the container with the inside of the shell facing up. 8. Place your geode on a drying rack or newspaper and allow to dry completely before handling. 9. To grow a second geode in the other half of the eggshell, simply re-dissolve the crystals remaining at the bottom of the growing solution in the microwave and follow the instructions above starting at step 5. 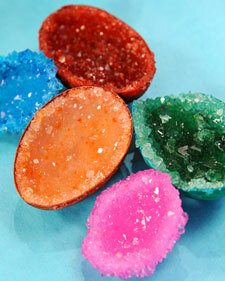 Geodes can be grown without using egg dye. The resulting crystals are clear to milky white, like quartz. While large chicken eggshells are suggested in this process, larger eggshells can be used. Simply increase the size of the plastic or glass container and double or triple the amounts of dye (1 packet), alum (3/4 part), and water (2 parts) used to create the growing solution. If you don't want to blow your own egg or would like to try a larger eggshell, pre-blown shells are available from The Eggery Place. Alum is available at most grocery or drug stores but can also be purchased online from Talas. Powdered egg dye is available from Surma: The Ukranian Shop. Ready-made Crystal Egg Geode kits available from Professor Figgy's Fabulous Science Kits at professorfiggy.com. Akin to the process of making Rock Candies. Except you wouldn't want to eat it, lol.